Yesterday’s de facto national championship preview focused on the coaches. Today’s looks at the players. Alabama and LSU players were in the news before the season even started, which, given each team’s potential for success isn’t surprising by itself. That both teams’ players were in the preseason news for off-field reasons is notable, though. It may seem like an age ago, but Alabama was one of the places hit very hard by the tornadoes that devastated parts of the lower Midwest and Southeast earlier this year. Tuscaloosa was a direct hit. A month later, Sports Illustrated ran a cover story by Lars Anderson that is one of the most powerful sports pieces I’ve read. Facing personal losses themselves, the Tide football players nevertheless had to stand tall in a community and a state that looked to them– as they always had in good times– for support in bad times. Terror, Tragedy And Hope in Tuscaloosa. On the field, the 2011 Alabama squad is without Heisman Trophy-winning RB Mark Ingram, Jr. (now of the New Orleans Saints), receiver Julio Jones (now of the Atlanta Falcons), and quarterback Greg McElroy (now of the New York Jets). 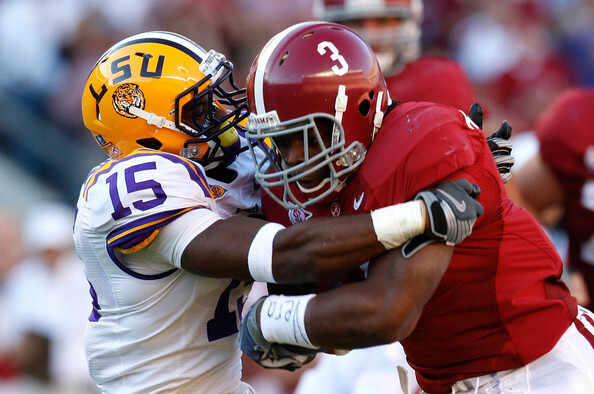 LSU lost six players to the 2011 NFL draft, including corner Patrick Peterson (now of the Arizona Cardinals). This entry was posted in ALDLAND and tagged alabama, baton rouge, college football, espn, lsu, oktc, sec, sports illustrated, sportsbybrooks, tuscaloosa by AD. Bookmark the permalink.